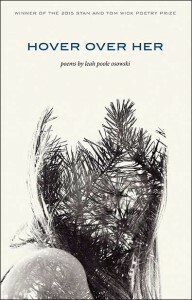 When I read Leah Poole Osowski’s new collection of poems, I kept a notebook beside me. As I made my way through the book, I sketched in my notebook: a hollow catalpa pod holding several baby teeth, a water-ring bracelet, a conch-shaped heart, a moon-sliced radish. The images map out a landscape of girlhood, adolescence, and early adulthood. "The images map out a landscape of girlhood, adolescence, and early adulthood." From the first poem in the book I’m introduced to this landscape. When I read the opening lines, “We came in folded bodies in inner tubes / roll downing lawns / We came calf-bruised,” I imagine the girls’ legs bruised from rolling down a hill in inner tubes. I consider the dizziness I felt when, as a girl, I rolled down the grassy hill in the park down the street from my house. But I also think about a calf, a baby cow, bruised from being born. As I make my way through the book, I think about the three girls in this book as calves, born bruised, born already knowing something about vulnerability and hurt, knowing that girlhood is a landscape in which girls’ bodies are often vulnerable. After reading it, I read it again, unable to get this map out of my head. Julia Koets’s poetry collection, Hold Like Owls, won the 2011 South Carolina Poetry Book Prize and was published by the University of South Carolina Press. Her poetry and nonfiction have been published in journals including Indiana Review, The Los Angeles Review, and Carolina Quarterly. She has an MFA in poetry from the University of South Carolina and a PhD in creative writing from the University of Cincinnati.